90% of Female Bloggers Want to Work with Brands: Is Yours One of Them? Nearly 60% of women bloggers indicate they want long-term, deeper relationships with a few special brands. Compensation matters. 90% are interested in working with brands, so long as there is some form of compensation. Social good matters. Campaigns that include an element of social good increase trust levels for 56% of bloggers surveyed. 70% of bloggers trust a brand more when that brand is promoted or recommended by someone they know from a blog or social media. 87% of bloggers said personal feelings about a brand will influence whether they work with that brand. 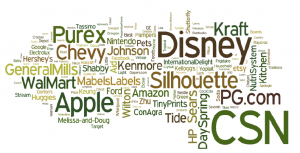 Brands like Purex, Disney, Kraft, Silhouette, Proctor & Gamble, and CSN were given high marks for their blogger relations. Female bloggers don’t want to feel they’re just a name on a list. Brands need to reading their blog posts, comment on the blogs and engage in the conversation happening online. Not all female bloggers are mom bloggers, and not all mom bloggers are the same. Some are professionals, and some are hobbyists. Know the difference. Provide products to review when asking for a product review. More and more bloggers are being contacted by PR professionals offering to “walk them through the product” or providing “the information you need to write a review.” Understand how the product review process works. Rarely will a blogger risk her reputation and personal brand to endorse a product she hasn’t experienced. Make your brand and its representatives fully accessible online through the use of social media, branded communities, conversational marketing, and corporate blogs. How does your brand rate in its ability to connect and build a relationship with key female bloggers? Thank you for linking to our study! My pleasure — it provided some really great information! What an excellent article. I would love to work with brands on a deeper level; my problem has been that as a SAHM I need cash, not products. We women bloggers each reach a large audience; it’s time for advertisers and brands to start looking at us as part of their advertising budget. A tube a toothpaste for a blog post is not worth my time.